We have seen that a biological character that sets off the fungi from other organisms is their ability to digest wood. Fungi can cause decay and ultimate destruction of standing trees, felled timber, plant litter; and all sorts of timber construction (Schwarze, 2007). In the two hundred years or so that the Britain ‘ruled the waves’ with its wooden ships, fungi were the bane of the Royal Navy, which always preferred oak for the hulls of its ships. If our native forests had been able to supply sufficient English oak no other timber would have been used. Conservation legislation in Britain probably started with various Acts of Parliament that were intended to control felling and use of timber, and encourage attempts at reforestation, specifically to safeguard the supply of timber for ship construction. But wooden ships have always suffered from rotting of their timbers. Cycles of alternate wetting and drying of parts of the woodwork, poor ventilation and even the use of unseasoned wood in constructions all favour the development of the fungi to which have evolved alongside the trees to use wood as a nutrient. Use of well-seasoned timber and provision of adequate ventilation are the keys to keeping timber constructions in good condition. Structural timber is no different from other wood; it will decay unless kept dry. Proper building design is a key. The fungi causing the rot are those common in woodlands, and for the most part they are indifferent to the carpenter’s expertise. Wood which is always dry is immune from fungal attack. If used out of doors or in humid conditions internally, all wooden structures eventually rot unless treated with some preservative. All kinds of wood are liable to attack. Resistance to attack is relative, soft woods being generally more susceptible than hard woods like oak, yew and teak. There are three fungi which may be responsible for dry rot damage, but one called Serpula lacrymans is the chief culprit. When spores of this fungus fall onto damp wood they germinate and this is one reason why wet timber is prone to attack. The hyphae penetrate into the wood, releasing enzymes that extract nutrients from it. The fungal hyphae may remain wholly within the wood, with no external sign of their presence until severe rotting has developed. Then bulging and cracking of the surface are early signs of attack, especially in painted wood, although mycelium and fruit bodies soon become evident (Fig. 3). Fig. 3. 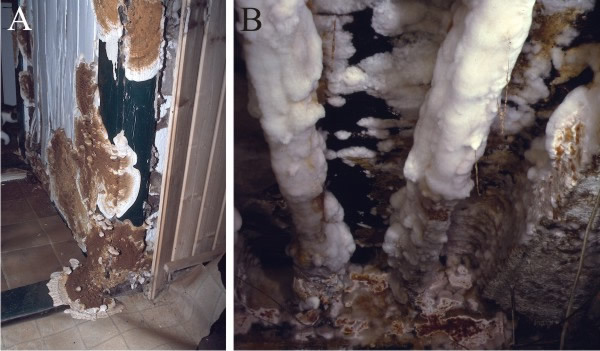 The dry rot fungus, Serpula lacrymans, growing in the wall panelling (A, left) and roof beams (B, right ) of an infested basement. The orange-brown areas are the resupinate fruit bodies. Photographs kindly provided by Dr Ingo Nuss, Brunnenstraße 6, 93098 Mintraching-Sengkofen, Germany. The fruit-body of this fungus is not a mushroom, but rather, a flat, orange-brown or cinnamon-coloured resupinate fruit body that ranges in size up to a metre or so across. The numerous spores can form rust-coloured deposits on furniture, floors and other surfaces and these are often the first sign of dry rot which are noticed by the occupant of an infected house. Serpula forms strands of hyphae which can be 5 mm thick. The strands are invasive and the cells of which they are made co-operate to grow away from the food source which is already infected to find other food sources (see the Linear structures: strands, cords, rhizomorphs and stipes section of Chapter 9; CLICK HERE to view the page). The strands can translocate food materials efficiently and this enables Serpula to spread over materials and structures from which it can derive no nutrition. When Serpula grows on wood it decomposes it and eventually reduces the wood to powder (that's why it's called ‘dry’ rot). But when the chemicals that make up wood are digested, water is formed equivalent to half the dry weight of the wood. During active growth, therefore, the fungus can provide itself with the water it needs; so although it must have moist wood to begin its attack it can continue growth into dry timber. Indeed, when growth is luxuriant, there may be excess water produced from wood decay and this is exuded by the fungus in droplets. These are the tears suggested by the ‘lacrymans’ part of the binomial. In a real sense the strands are explorers and if wood is reached in a strand’s wanderings it is immediately attacked and eventually destroyed. It is the strands that make wood decay fungi so dangerous to constructions because strands penetrate through pores in brickwork, cement and stone, under tiles and other flooring, and over plaster and other ceilings; indeed, across anything that gives mechanical support. In the laboratory strands have been grown across a full metre of totally dry plaster board, and they can do this so long as the originally infected wood continues to provide nutrition to the exploratory strand. Serpula strands can translocate food materials in both directions (in the laboratory, it can be shown that nutrients can flow in both directions at the same time). So when the strand finds newly discovered timber to attack, maybe several yards away from the original, the whole infestation is effectively integrated into a single organism which can become the size of the whole building. About 60 or so indoor wood decay fungi that have been described and the strand morphology of the 20 most common species is sufficiently distinctive for the infesting fungi to be identified from the characteristics of the strands (Huckfeldt & Schmidt, 2006). The fungi most commonly encountered as causing damage to building structures are the dry rot fungus (Serpula lacrymans), cellar rot fungus (Coniphora puteana) and wet rot fungi (Antrodia vaillantii, Antrodia xantha, Asterostroma spp., Donkioporia expansa, Paxillus panuoides, Phellinus contiguus, Tyromyces placentus) (Singh, 1999). A fungus called Phellinus megaloporus (stringy oak rot) is found as frequently as Serpula in parts of Europe and was responsible for serious damage to the roof of the Palace of Versailles. It requires very moist conditions and a relatively high temperature. It probably causes more rapid decay in oak than any other fungus, but it does not spread rapidly because it does not form strands. S. lacrymans is by far the most serious cause of decay of building timbers in the UK and northern Europe. The dry rot fungus occupies a specialised ecological niche in buildings because of its unique biology, but despite its prevalence in structural timber across Europe, it does not occur in European woodland. The species has only been found in the wild in the Himalayas (Singh, 1999), where Serpula lacrymans is typically found in spruce and other conifers in boreal forests. When these trees were harvested for constructing buildings, the dry rot fungus migrated indoors, adapting to thrive in man-made environments, and the international trade in timber gave it the wide distribution in buildings in the temperate zones it enjoys today. Comparative genomic analyses combined with growth experiments using this species and its wild relatives have established that Serpula lacrymans evolved a very effective brown rot decay compared to its wild relatives, enabling an extremely rapid decay of constructional timber. The species has adaptations in nutrient and water transport that promote hyphal growth and invasion of timber in houses, but poor combative ability with other brown rot fungi in vitro. So, it appears to be an ecological specialist that is preadapted for success in the sheltered indoor conditions of domestic constructions (Balasundaram et al., 2018). Not all wood deterioration results in destruction of the timber. There are other fungi (sap-stain fungi) that discolour wood. Although the strength of the timber is not lessened, the discoloration (generally called spalting) renders the wood unfit for most purposes and so its value is downgraded because the unsightly timber cannot be used as a natural finish. Staining develops during storage of the sawn timber; sap-stain fungi develop most rapidly when the wood has high moisture content and the weather is warm. So the oft-repeated preventatives apply: use well-seasoned (i.e. dried) timber and keep it well-ventilated. Some staining is actually sought-after for special cabinet work. The fungus Chlorociboria aeruginascens, produces a characteristic bright blue-green colour in oak and other deciduous trees. Wood stained in this way has been used for ornament, usually marquetry, in products called Tunbridge ware. There is even a British patent issued in the early years of the twentieth century covering the artificial infection of trees with C. aeruginascens to generate stained timber. Wood turners appreciate the pleasing colour patterns that may result from discoloration in wood caused by the early stages of rotting. Dark winding lines and thin streaks of red, brown and black pigmentation, called zone lines, are often found in infested wood. Fig. 4. Spalted timber products. 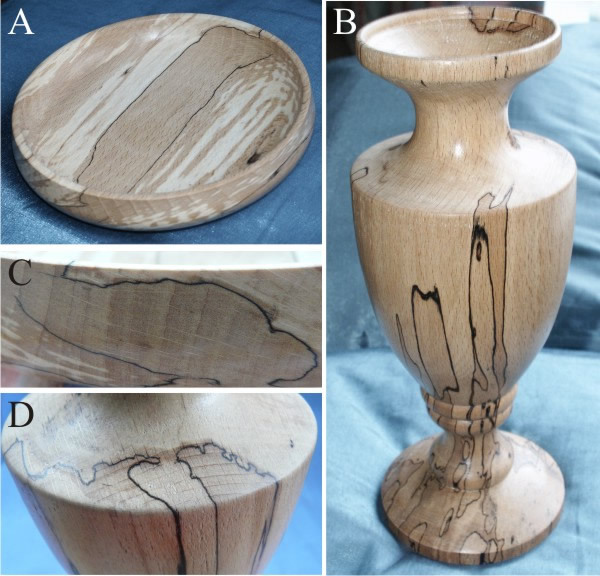 Turned wood specimen dish (A) and vase (B) made from spalted beech. Both show the attractive figuring of the timber that encourage wood-turners to use such timber for its decorative value, but close-ups reveal the 3-dimensional distribution of the zone lines between fungal colonies (C and D and see Fig. 8 in Chapter 7) that produce the spalting. The vase was made by Matt Cammiss of the Birstall Woodturning Club, West Yorkshire. Photographs by David Moore. This type of spalting results from interactions between different fungi growing in the timber (Fig. 4). The zone line shows where the different mycelia interact by creating barriers formed from plates of mycelial cells that have darkly pigmented secondary walls, referred to as pseudosclerotial plates (because the cells look like those of the sclerotial rind illustrated in Fig. 5 of the Wall synthesis and remodelling section of Chapter 6; CLICK HERE to view the page). Zone lines themselves do not damage the wood, though the fungi responsible for creating them often do. Fungi also have a potential role in the biodeterioration/bioremediation of man-made polymers, which we will discuss in the next Section.